Indeed, Audi has been the main sponsor of the event in Milan. The tower has been conceived and designedby architect Luca Trazzi trans. 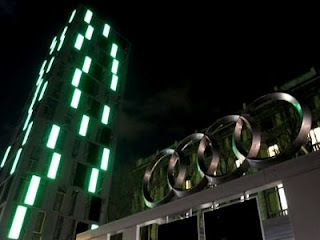 Immediately called Trazzi Tower, the tower construction was funded by Audi. 22 meters high, the building displays countless LED lights with 16 million color variations. The colors displayed by the building are controlled from a touch panel. During the day, the tower uses solar energy through its solar panels to feed and at night she eyeful with a colorful spectacle. Audi LED tower is erected in Piazza del Duomo. We owe the metal frame of the tower to the Italian company Olmi. LED lights and solar panels were manufactured respectively by Martini and Pramac.